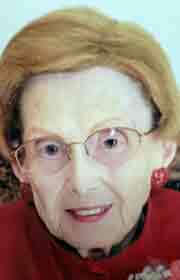 HARCOURT — Eunice M. Martinson, 95, of Perry, formerly of Harcourt passed away Fri­day, May 18, 2018 at Perry Luth­eran Home. Funeral services will be 11:00 a.m. Wednes­day, May 23, 2018 at Palmer Funeral Home, Gowrie with Pastor Max Phillips officiating. Burial will be in the Lost Grove Township Cemetery, Harcourt. Friends may call after 10:00 a.m. Wednesday at the funeral home. Eunice is survived by her daughters, Diane (Richard) Jones of Perry and Lois (Steve) Lamansky of Ankeny; grandchildren, Ryan (Pam) Jones of Ankeny, Melissa (Nick) Schlaud of Minnetrista, MN, and Doug (Michelle) Lamansky of Collierville, TN; great-grandchildren, Carson and Sydney Jones, Ella and Owen Schlaud, and Mila and Tessa Lamansky; sister-in-law, Arlene Martinson of Montgomery, IL; and brother-in-law, Phillip Martinson of Fort Dodge. She was preceded in death by her parents, William and Mary Gorden; husband, Gordon; and sister, Freda Hornaday. Memorials may be left to Mayo Clinic, Rochester, MN and the Perry Lutheran Home Acorns & Oaks Daycare.